This Boston quartet released Manhole, their debut album, in February of this year. Sadly I have not heard much of them in the meantime. They definitely deserve to get more props than they have gotten so far, as they are a quality rock band. In a time where rock is fading out, it is a definite rarity to find a rock band fronted by a female lead singer. 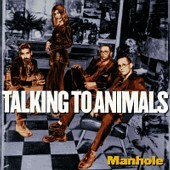 Talking to Animals is a great rock band with a female singer - they pull it off nicely. Julia Nash has an excellent voice, one of the best female voices I have heard in quite some time. She swoons, she screams, she flutters, she does it all. The voice has a harder edge than that of say Sarah McLachlan or any of the recent female stars - more reminiscent of Linda Perr (4 Non Blondes) or Joni Mitchell. The crescendos / decrescendos coupled with the emotion she pushes through help her cause greatly. You know when she is happy, when she is sad, and when she is just plain pissed off. Let's not forget the band now. They can rock, and do so on the album. Their contrasts in style are as plentiful as those found in Nash's singing styles. The entire album has a dreary, melancholic attitude to it - usually set up by the bassline. The riffs found throughout are nothing of the pop variety, more quality rock and a definite stray from powerchord grunge rock. Some of the songs to check out include "Mouth Tattoo" and "Kid is not Alright" (my favorite).